To protect the skin from UVA and UVB-radiation. Fast penetrating matt cream for face and body. Only available in New Zealand. Not currently approved for sale in Australia. The sun protection cream SPF 30 contains DMS® components and the sun protection filters ethylhexyl methoxycinnamate (UV-B filter), octocrylene (UV-B filter), titanium dioxide (physical filter), bisethylhexyloxyphenol methoxyphenyl triazine (UV-A/UV-B filter), butyl methoxydibenzoylmethane (UV-A filter). 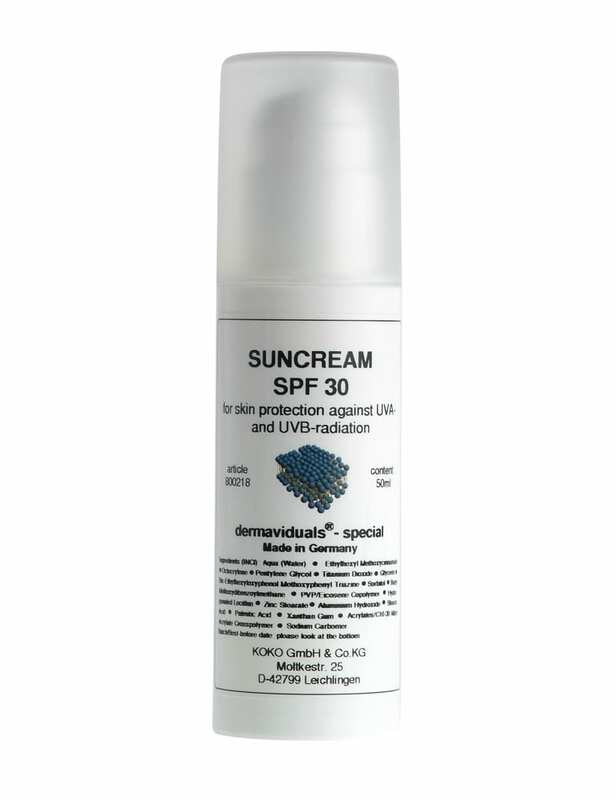 dermaviduals® sun protection cream SPF 30 complies with the European Commission Recommendation for a high level of protection. Creams with SPF 30 provide about 96.7 % protection from UVB-radiation or in other words, they allow to stay about 30 times longer in the sun before an erythema (sun burn) will develop. Since the thermal radiation of the sun (infrared) is quite stressful for the skin it is recommended to expose the skin in moderation despite the sun screen. Excessive sun exposure is a serious health threat. Particularly babies and toddlers should not be exposed to direct sun light. Apply the cream before the skin is exposed to the sun and let it absorb into the skin. It is recommended to reapply the cream on the dry skin if you are sweating or after swimming. Also reapply cream regularly to maintain protection. It is recommended to use a sufficient amount of the sun protection cream in order to achieve the labeled factor 30 – if you do not apply enough cream you are less protected.